Paige Simon was the only girl Declan ever loved. The only one capable of silencing his voices, the only person to ever have faith in who he was, until the day her faith turned to doubt and destroyed everything they'd made together. Declan O' Connell was the only person Paige could be herself with. The only one she could rely on, until the day she was forced to make a choice that would condemn them both. They've had years apart, and second chances don't belong to the damned. But when you come face to face with your savior, it's almost impossible to walk away. In order to move beyond the sins of their past, and forever silence the demons in his head, they'll have to risk it all. But with love, there are real reasons to be afraid, and sometimes your salvation is your damnation. There’s no wonder other reviewers used words such as powerful, moving, emotional, touching, brilliant, incredible, haunting and beautiful to describe this wonderful second chance love story.. because it was all that and so so much more. You’re captivated from the start as you hear the moving story of a young love that went heartbreakingly wrong, the impact that had on their lives and the insightful look into the life and challenges of someone with a mental illness.. especially after that breakup. There’s also the damage and destruction caused by religious zealots on that tender relationship and the moving love story that grew from the embers of that love. The love Paige and Declan had for each other was undeniable and it shone through every single chapter.. and, when it finally happened, you could feel the soul-to-soul connection between Paige and Declan when they forgave each other, accepted that they couldn’t change their pasts and eventually forgave, made love and claimed back their lives. I was obsessed, possessed, totally wrecked and emotionally ruined by A.M. Johnson’s epic powerful storytelling.. but what really gave these characters a heartbeat was the outstanding narration by Tracy Marks and Aaron Shedlock who made this Dual POV story absolutely unforgettable. Worth a credit? YES.. it was different, compelling, unique, moving and hauntingly beautiful too as two emotionally damaged characters find their way back into each other’s arms.. despite the odds, despite others, despite their histories and despite the cruel hand of Fate. I love AM Johnson's writing style, she really knows how to tell the story! I have listened to another audiobook of hers and loved it too! This book is a little dark and depressing throughout the beginning the book because it deals with serious mental issues. The narration was PERFECT! That isn't much of a surprise for me but that's because I love both Aaron Shedlock &amp; Tracy Marks. I say this every time but I really love them together in a dual narration. Their tones are not completely opposite and it makes the narration flow so well. Usually a male &amp; female narrator have such extremely different tones and pitch that it can be jarring but these two are so smooth. This was such a touching story. I had read the book but hearing it took it to a whole new emotional level. The narrators did such a fantastic job that I could feel the despair and sorrow of Declan’s story and the love and need in Paiges story. It was heartbreaking and wonderful all at the same time. Such a fabulous Audiobook. I cannot wait for the next one. is she a robot or digital voice? 30 minutes In and can't listen any longer. she sounds like a robot or digital voice. Incredible Book with Outstanding Narration! WOW! When I first read Possession, I was stunned by how much it spoke to my heart. Hearing it though, took my feelings to a whole other level! This book deals with some very difficult issues like mental illness and religion, but I felt that they were all handled honestly and realistically. It was this book that made me a fan of AM Johnson for life and I can't recommend her books enough! Tracy Marks and Aaron Shedlock really knocked this out of the park and were the perfect Paige and Declan! I was already a fan of Tracy, but this is the first time I have ever heard Aaron Shedlock perform. I can't even express how blown away I am by his narration. He truly gave life to the voices inside Declan's head. I had chills listening to his performance and it made the journey so terrifyingly raw and beautiful. I am definitely going to listen to more of his narrated books. 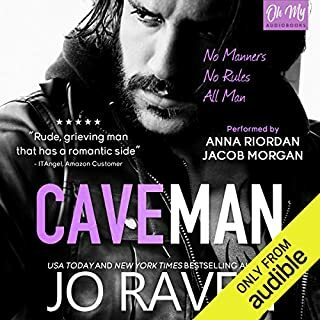 Hands down, this is one of the very best audiobooks I have ever listened to and you don't want to miss it! 5+ CHOKING BACK TEARS stars!!!! This story had me in knots and I was so enthralled that I had to listen to it all in one sitting!!!! This is my first book by AM Johnson and WOW can she write a very powerful and very emotional book! She took the topic of mental illness and weaved it so brilliantly through this second chance love story, like no other that I have read before. Declan and Paige are such an amazing couple and also as individuals. I loved that although they meet again after 9 years apart, their journey is not without obstacles along the way. There is much to overcome before their HEA, and oh what an amazing and beautiful HEA it was!! Their time spent together reuniting over their artwork was just beautiful. Aaron Shedlock and Tracy Marks are an amazing collaboration. They both put so much emotion and heart into their roles that I felt like I was right there with them in each scene. My first A.M. Johnson book and I am blown away! This book encompasses so many topics, I don't even know what to talk about first! When I first saw the title, I figured it was going to be a book about possession of another..he owns her, she owns him and while the couple, Declan and Paige own each other's hearts, the title means so much more. A.M. Johnson takes on the story of mental illness and how it takes possession a person. Put that together with a highly religious group and you have a book full of taboo topics that are masterfully woven into an incredible love story. This second chance romance shows us how adversity and illness can be conquered. It brings out the beauty of a person's soul and the strength of love, how to live with regret and heartbreak, and how to mend their hearts back together with each other. It's a book that will stay with you. Put to narration with Aaron Shedlock and Tracy Marks, this incredible book comes to life. Shedlock creates the character of Declan so well you can feel his broken heart, the frustration with his illness, the anger he has pent up and the love that fills him. 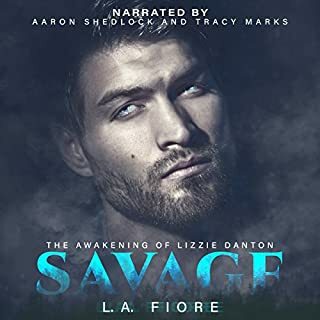 To compliment his voice, Tracy Marks gives Paige raw emotion and ferocity to overcome obstacles in her life and find her way back to Declan. Their inspiring performance together of this book will bring on the book hangover leaving you wanting more. Aaron Shedlock performance was absolutely heartbreaking, his tormented internal voices allowed you as a listener to get a small insight into this mental illness. I felt every aspect of his struggle and sorrow, as sad and painful Declan’s and Paige’s history was I wish everyone had someone to love like them as Paige loved Declan. I enjoyed this story very much. It was the first romance I've listened to where mental illness was involved and it was done in such an informative way. Declan and Paige were both strong and vulnerable I was rooting for their happily ever after pretty much since chapter 1. This was my first A.M. Johnson story and now I am ready to dive into books 2 & 3 of this series. And of course I can't say enough about Aaron Shedlock and Tracy Marks. They are 1 click, no brainer narrators for me! This was my first A.M. Johnson book, and was chosen as a group listen. So, I had no idea what to expect. Well, Ms. Johnson has written a very poignant book, touching on some very sensitive issues. I was afraid this book might be depressing, but it was just the opposite. Though the topics of mental illness and cultish treatment have tragic consequences, this story is more about hope and overcoming huge challenges. The author writes these characters with such realism and such compassion, you feel you know these characters and they must be very real. It was a thoroughly engaging story! The narrators, Aaron Shedlock and Tracy Marks do a great job bringing these characters vividly to life. I have listened to both narrators before and know what to expect from them, and yet they even exceeded my expectations. I can't wait to continue with this series!